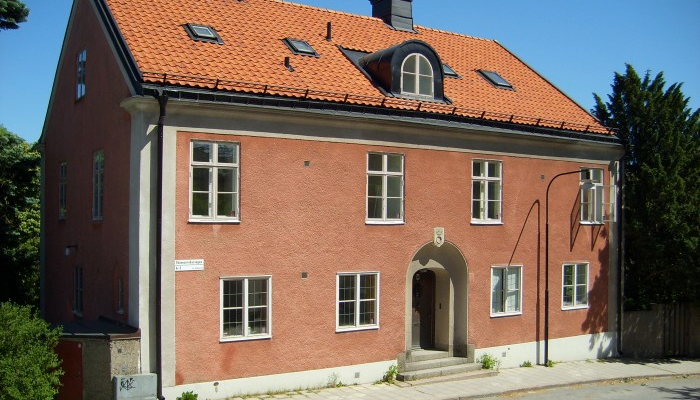 There was also info on what libraries needed to be installed, how to set up an ESP web server, connect to Wifi and more. A good place to get started. I soon realized that the code on randomnerdtutorials would be dangerous for this project. It works something like this: When you click a button on the web page, a new page is loaded. Appended to the URL is the name of the button that you clicked. This is a common way to pass data between html pages. The problem is that when the toast program is finished, it’s quite possible that you still have this page (with the button name) loaded in your web browser. 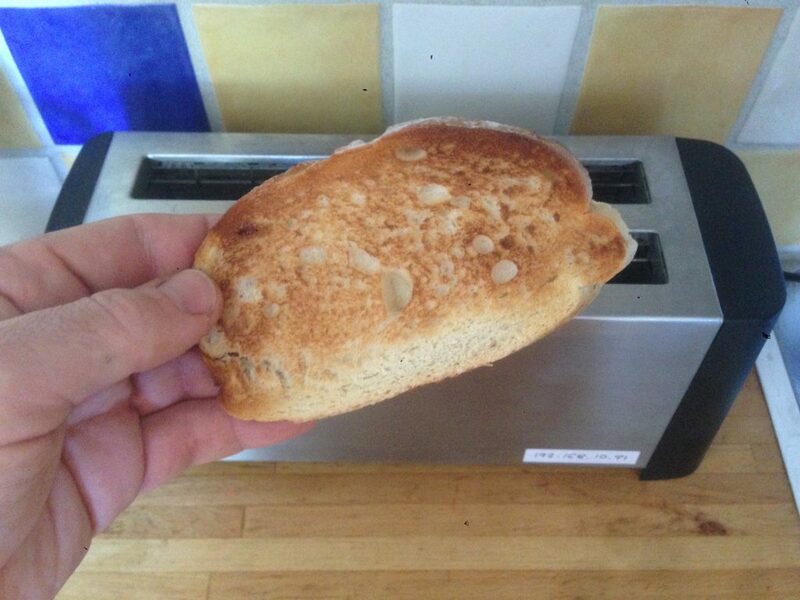 Which means that if you reload the page (which can happen automatically in many situations, ie on a computer restart) the toaster will start again. 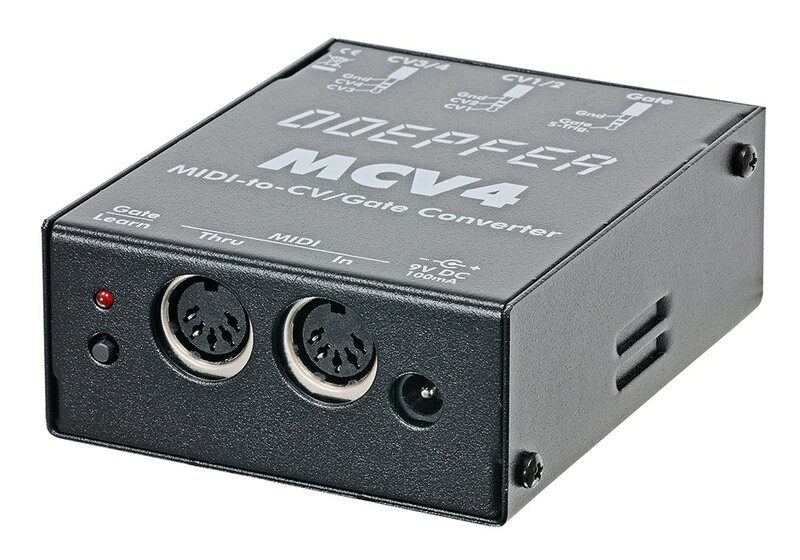 It seems Doepfer cut some corners when designing the MCV4 MIDI to CV interface. 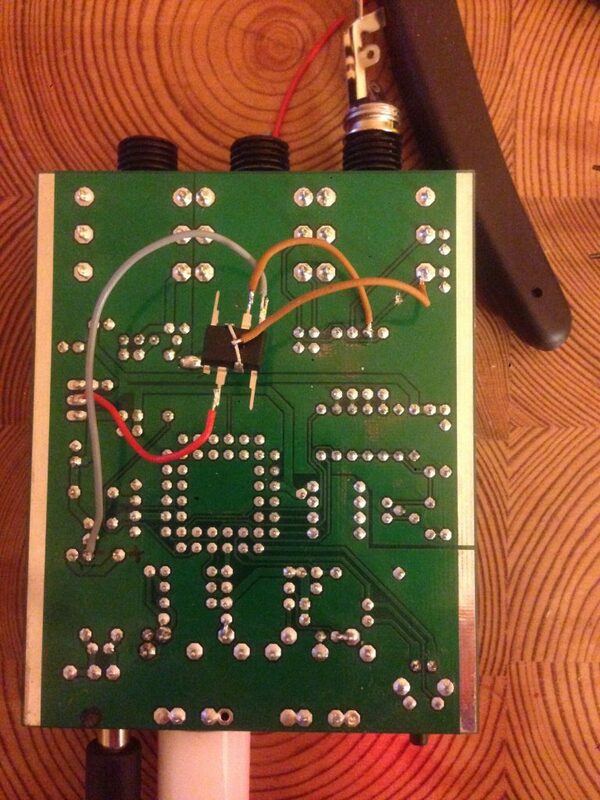 Firstly the MCV4’s voltage was to low to drive the Roland SH5 gate input. This can be remedied by opening up the interface to move a jumper, and then replacing the 9v power supply with a 12 volt one. After that the MCV4 controlled the SH5 gate and Pitch CV as expected. But it had no effect on the filter at all. That is because the output from the DAC isn’t buffered, and the DAC itself cannot drive the load of the Filter CV input. An MCP6002 OpAmp was connected as a basic voltage follower to buffer the Note Velocity output. 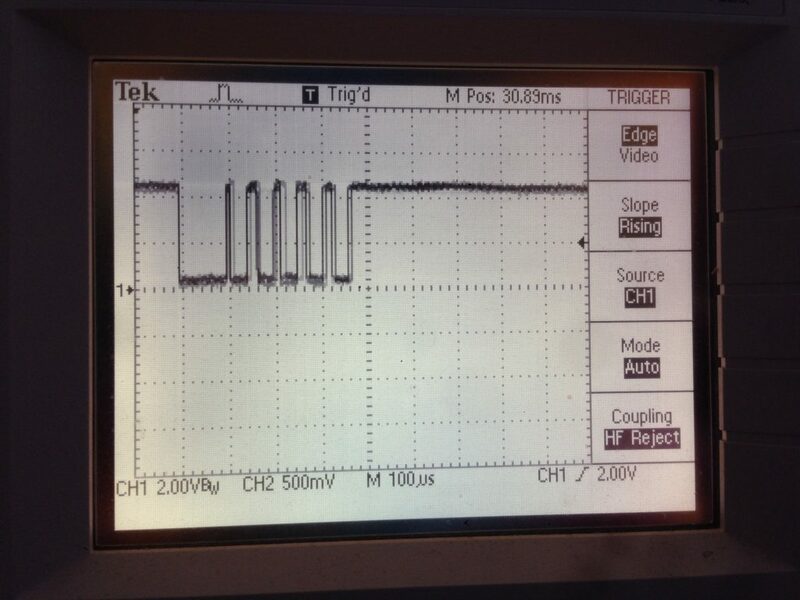 Beware that the image shows an unsuccessful experiment with a TL072, that has a different pin configuration. Don’t use this image as a guide for connecting the MCP6002! A mid-80’s drum machine, modified for MIDI-controlled sound chip selection, circuit bending and pitch. 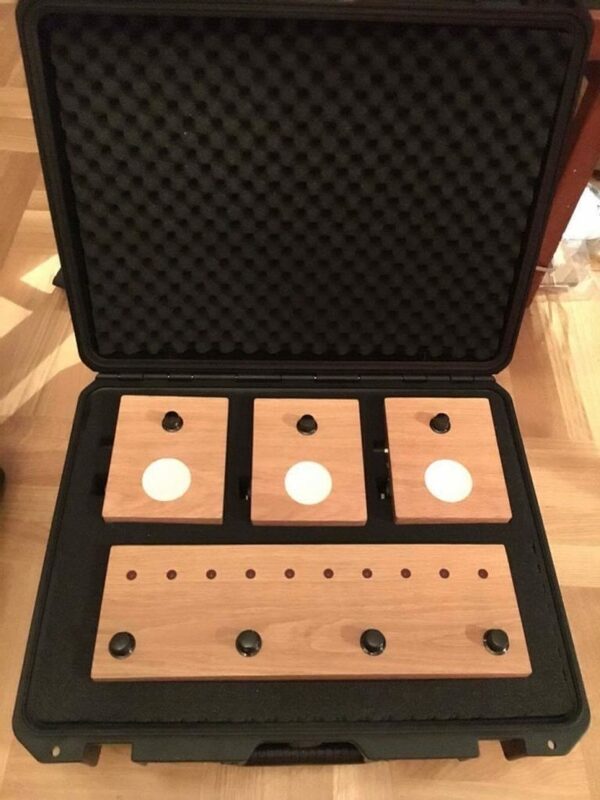 Any MIDI sequencer or keyboard can be used. No changes are made to the exterior of the machine. The pitch mod: The HC-SR08 is a development board for the Analog Devices AD9850 Direct Digital Synthesis chip. The output DDS frequency is controlled by The Nano, reading MIDI notes and pitch bend. The output square wave is used as a clock signal for the R-100’s Address Generation Unit. 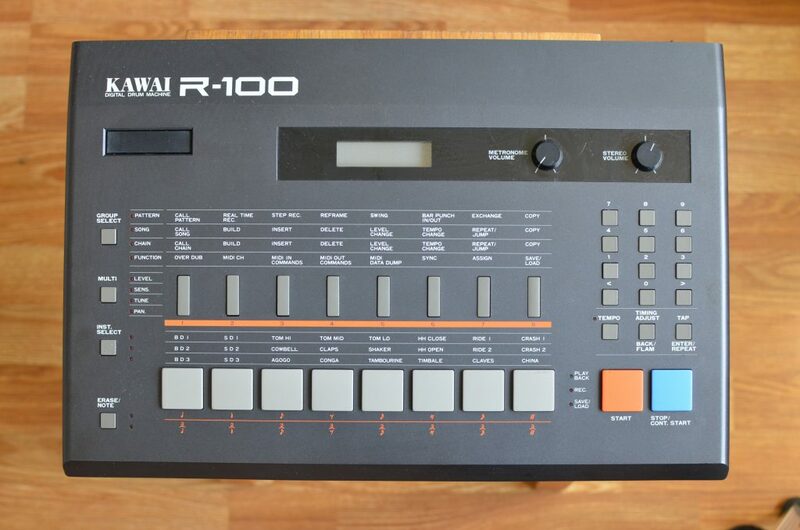 This means that when the Kawai R-100 tries to play any sound, the rate at which the sound sample data bytes are found in memory is set by the 9850 output. The circuit bend: There are pre-made circuit bend points in the ROM Switcher pcb. It’s sufficient to have the Nano connecting these points to ground, they don’t need to be interconnected. To get back to non-circuit bent sound, the Nano pins are left in a floating state. The sound quality of the bends are much like a comb filter or phaser. 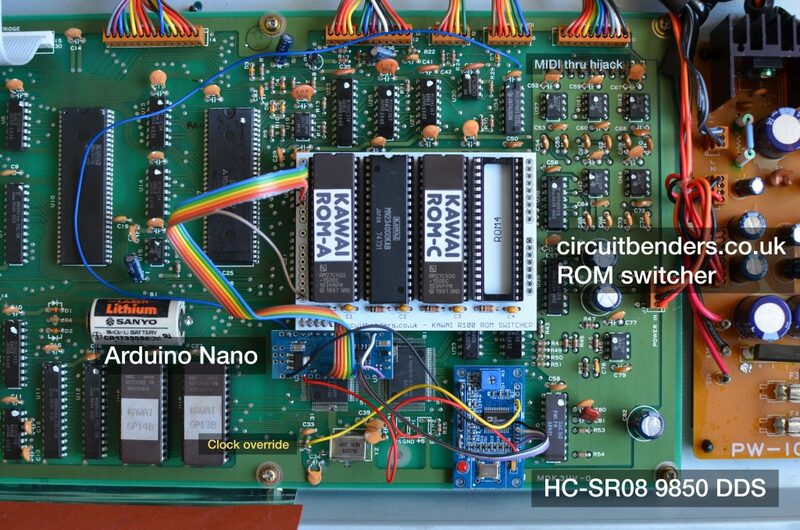 The ROM chip selection: To enable one ROM chip, the original ROM-Switcher connects the Output Enable (or possibly Chip Enable) pin of that chip to ground. Others are in HIGH state. 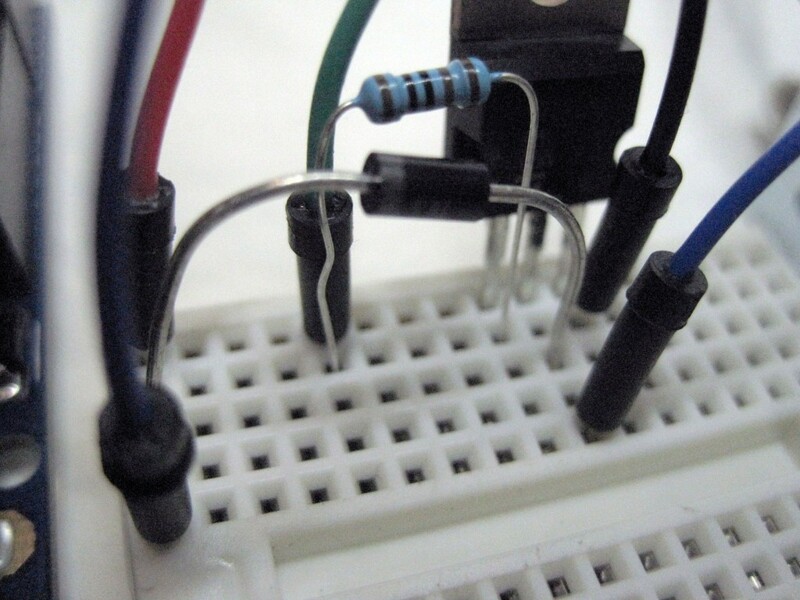 A very simple task for a microcontroller. 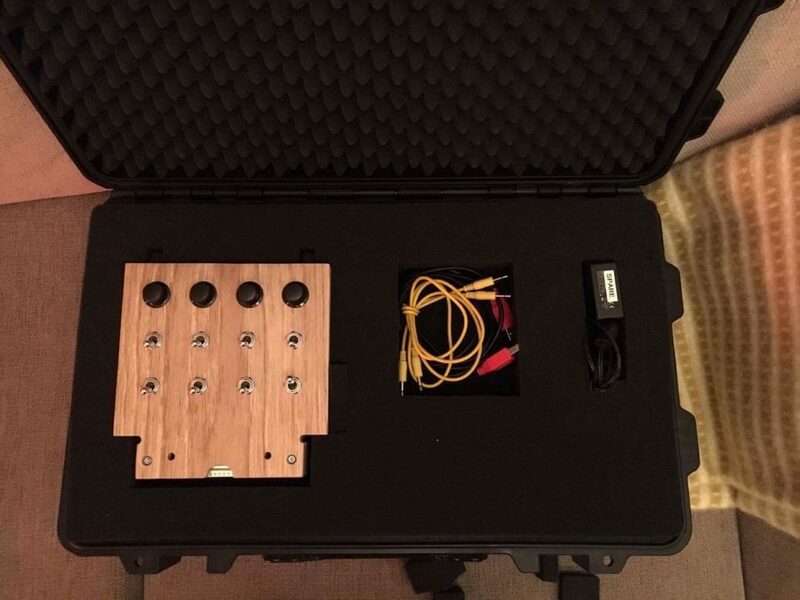 Two unusual electronic instruments that were part of a greater ensemble, built for an exhibition in China. Idea and hardware by Daniel Araya. Programming and I/O-electronics by 9bit. The Control Surface is a Standard MIDI Interface compliant unit, built to interface with a MAX MSP patch on a host computer. 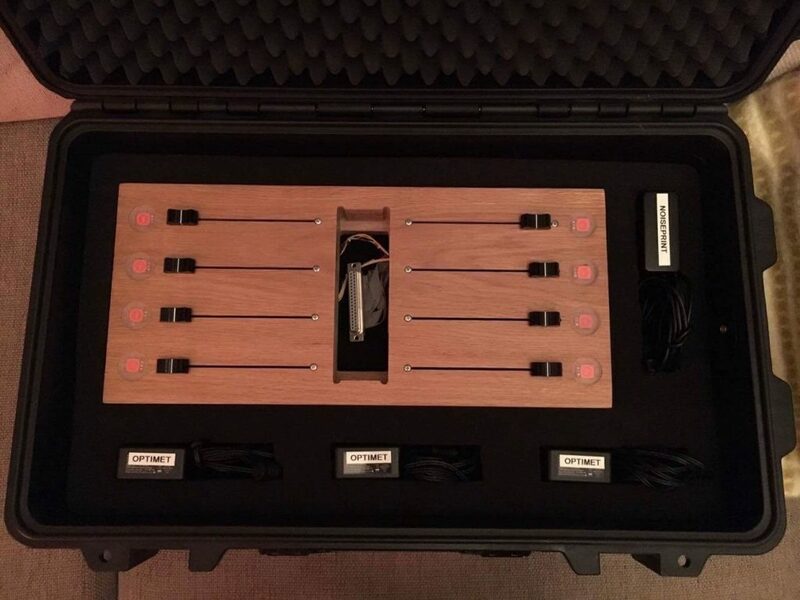 The Control Surface has about 40 faders, knobs, switches, touch controls and a status LED that is controlled from within MAX MSP. This is testing MUXes and SPI port expansions on a CNC-made prototype PCB. MIDI on the Arduino Uno was only implemented as “MIDI over USB”, since it was not to be connected directly to other MIDI-capable instruments, only to a computer running host software. Three metronomes were built, one master and two slaves. The tempos of the slave units are synced to the master but the beat patterns that they play differ. The pattern generation algorithms used are mostly Euclidean Polyrhythms of varying lengths and “densities”. 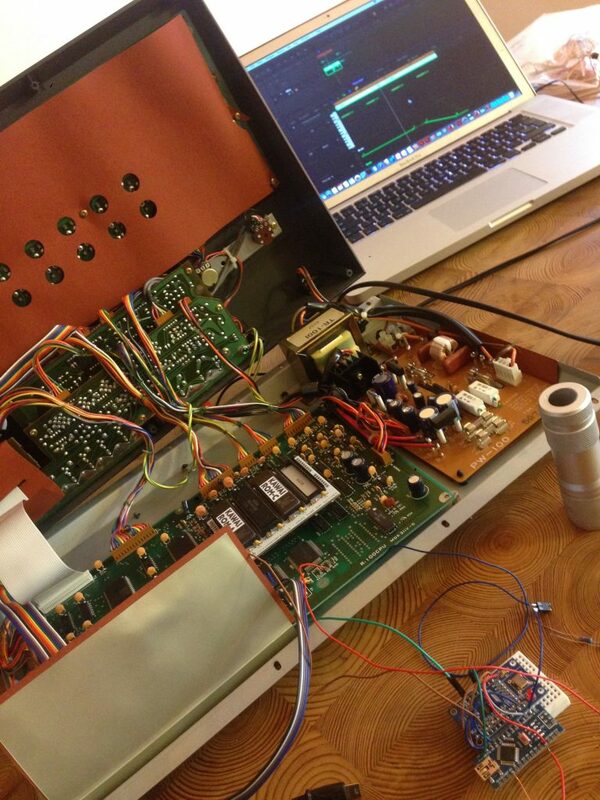 Thank’s to Wouter Hisschemöller’s page for cutting my firmware dev time. The master unit features a tempo knob, sync-to-slave output, metronome beep, metronome light flash, DMX output. The slave units feature a pattern length knob, pattern density knob, sync-to-master input, metronome beep, metronome light flash, DMX output. Fuses. There are a couple of user selectable operation modes of the AVR microcontrollers. 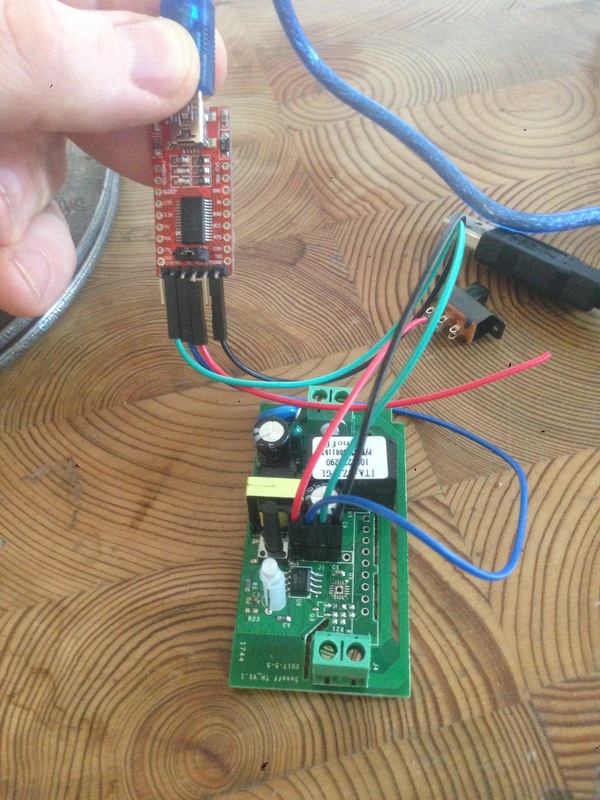 The fuses can’t be edited in the same way you normally program you Arduino. 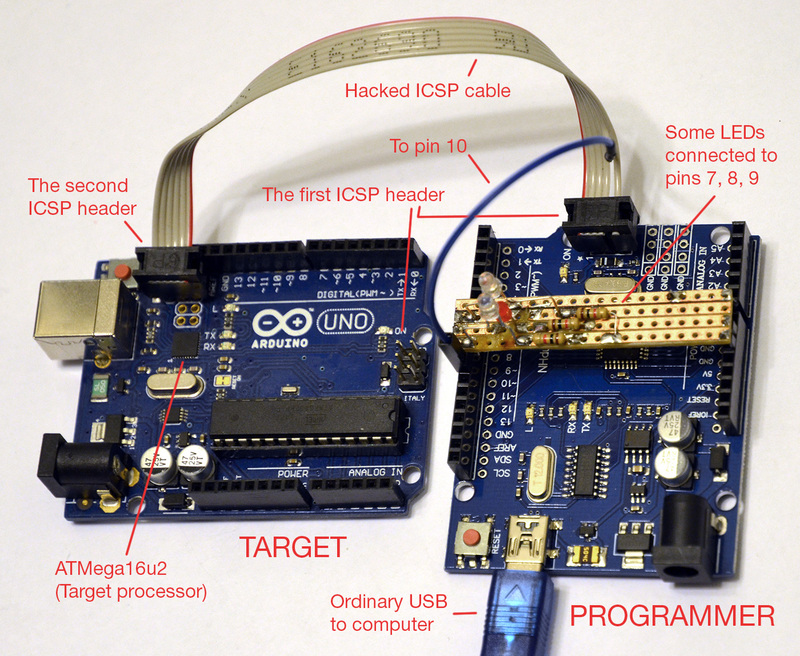 You will need a hardware AVR programmer, ie the one described here: Arduino as ISP. 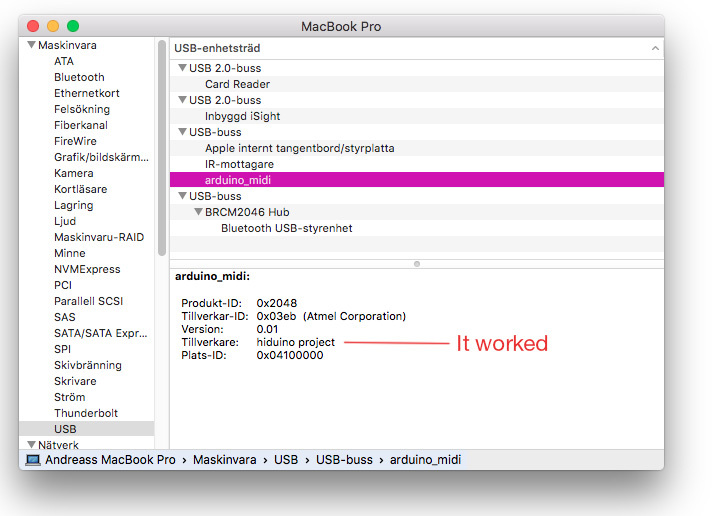 There are a few GUI softwares that are supposed to do this, but I couldn’t get any of the Mac OS X ones to connect to my Arduino/Genuino Uno, so I used AvrDude from the Terminal. 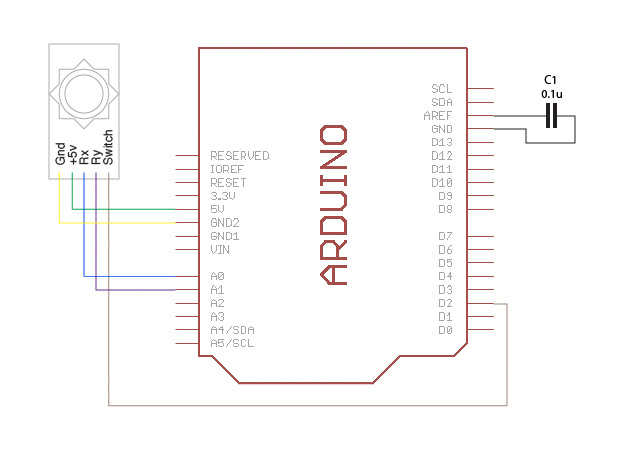 I wanted to do this in order to get a 16 MHz clock output on the Arduino Digital pin 8 / B0 / CLK0. This signal was to be used as a Reference Clock for the AV9110 Serially Programmable Frequency Generator. 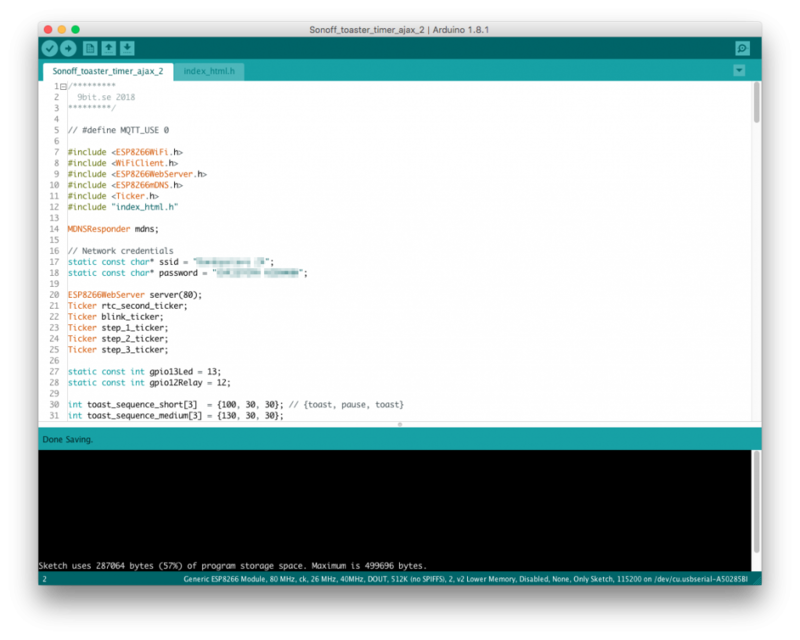 The above settings can be gathered from the output of the Arduino IDE when uploading a sketch to your Arduino. Please turn on “Verbose Output when uploading”. 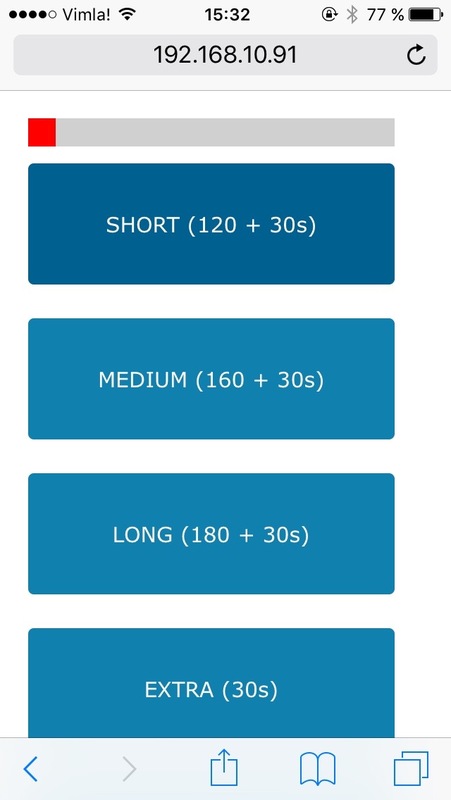 These are the new fuse settings from http://www.engbedded.com/fusecalc. I was mainly interested in CKOUT = true. 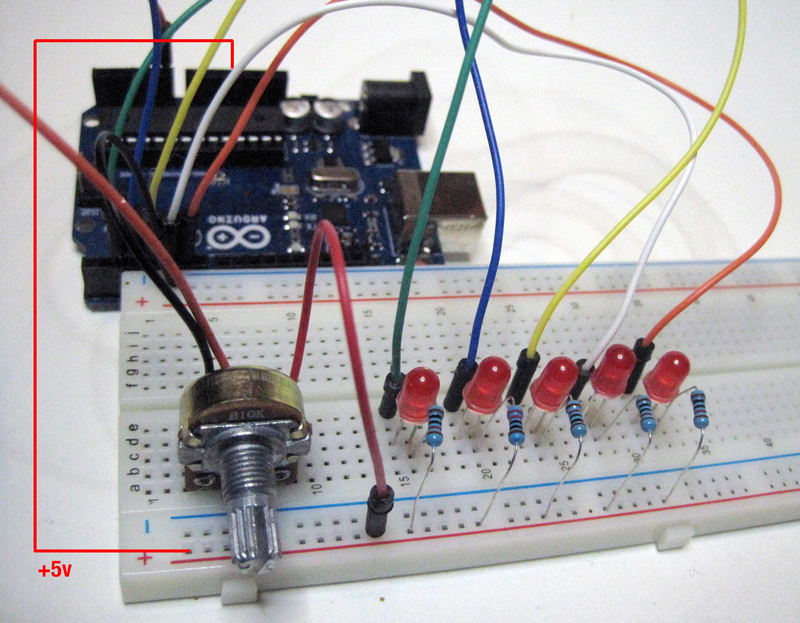 Setting the fuses wrongly can make your Arduino unresponsive. Please read up on which fuses NOT to change, prior to experimentation. 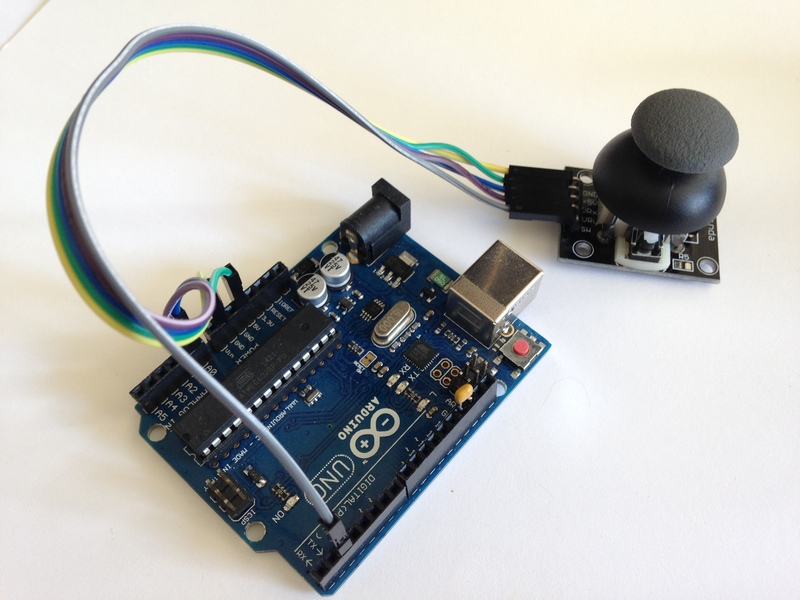 Connect an analog joystick to an Arduino. Read two analog values (x- and y-position) and a switch using a method witch does not hog the processor during the whole ADConversion. The capacitor reduces digital noise on the analog readings. ADCSRA |= 1 << ADEN; // Enable ADC, with no interrupt! A simple but effective project to demonstrate physical control over a computer screen. Please take a moment to think about how the variable values will be presented to Processing. You cannot just Serial.println(var1); Serial.println(var2); If you’d do that, there would be no way for processing to know which value comes from which variable. To help parsing the data in Processing, print the values on the same line, separated by a comma. Now, processing will se your two values like this: 233,856 and they will be considered a text String, not numeric values. (233 would be the value at Arduino pin A0 and 856 at A1.) You can easily convert such a string of words delimited by commas into an array of words. Use split(str,delimiter) in Processing. “233,856” will be converted to [“233”, “856”] and each item can be accessed individually, and treated as a numeric value. println(Serial.list()); // Print all available serial ports. 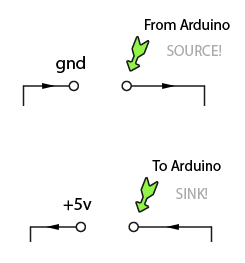 Figure out which one the arduino uses. // but I don't have Processing at hand right now..
You know you love it. The course contents were essentially the same as this course, and followed the posts on this site. Some of the students connected Processing IDE (on the Mac) to an Arduino using the serial-communications. 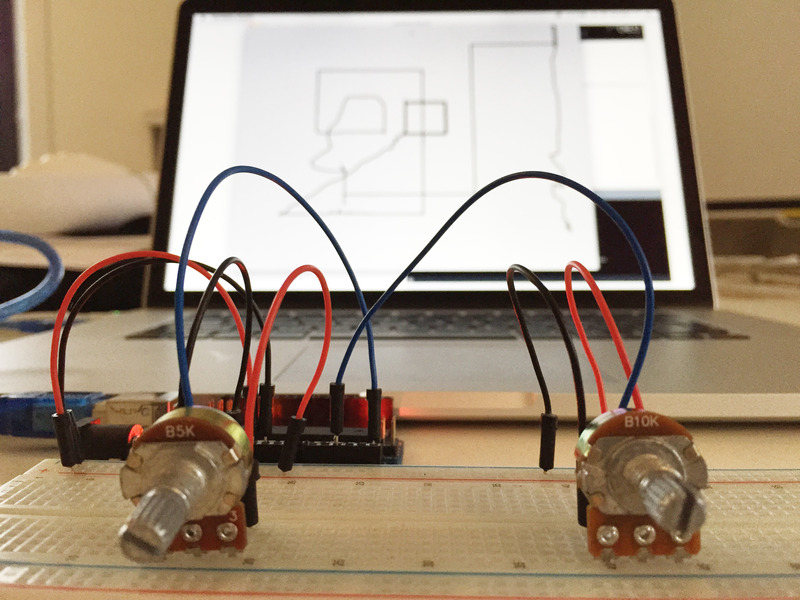 Thus, the Arduino became an interface to Processing’s on-screen drawing tools. 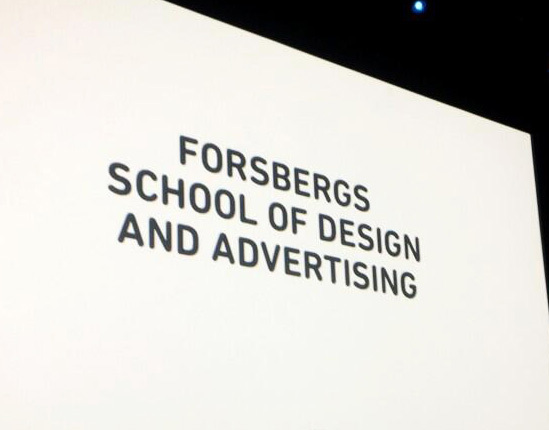 For an example, see this student project by Mattias Green. 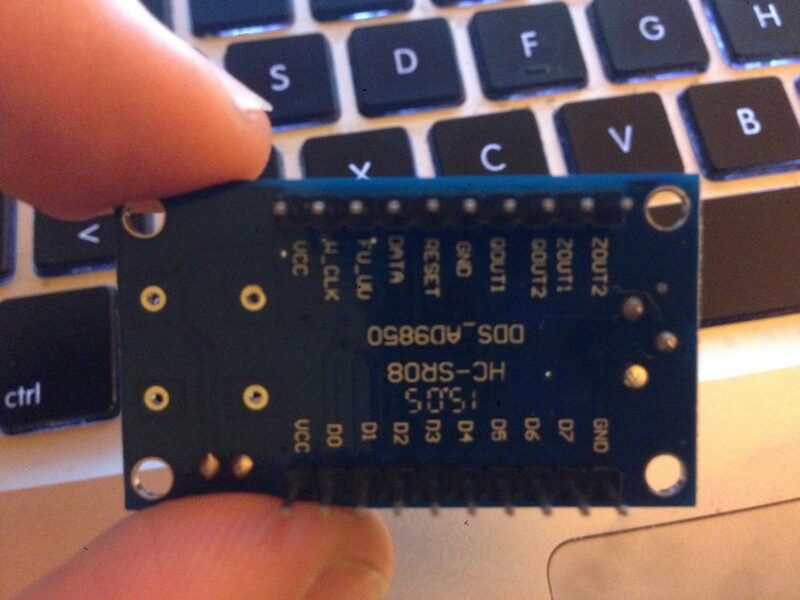 A distant colleague of mine happened to have an Arduino course at the same time. 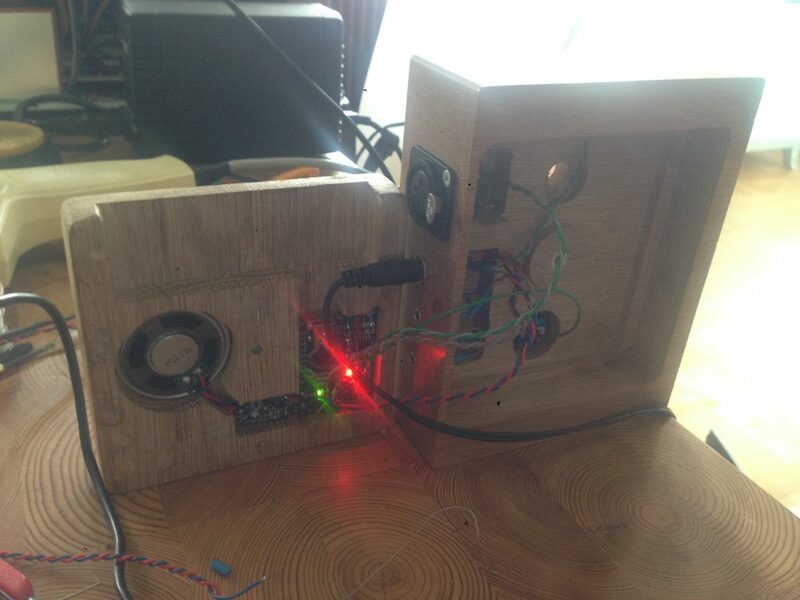 They also connected Arduino to Processing, to enable physical control over audio sample playback on the computer. A few other things need to be added, for example a couple of decoupling capacitors, 0.1µF and 10µF, and maybe a fat electrolyte for smoothing out effects of sudden power draws. 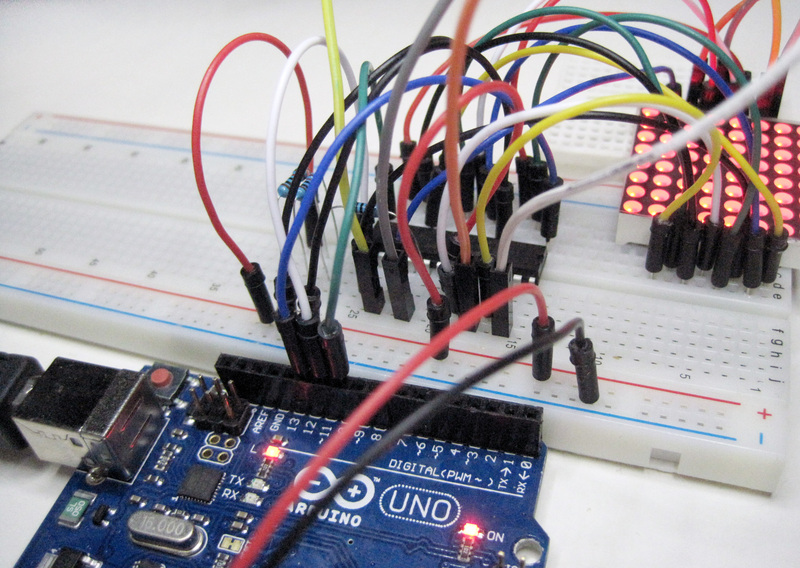 SainSmart UNO R3 – Arduino Forum Lessons for a similar kit. The advanced lessons are not covered in this blog yet. 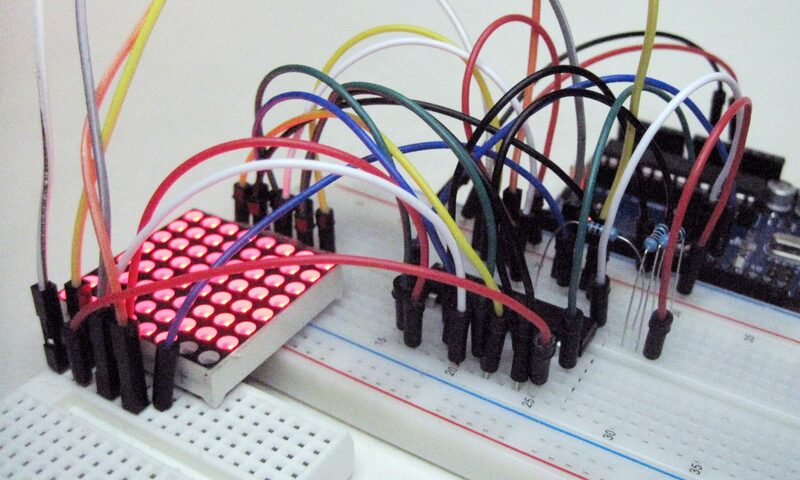 The 8×8 LED matrix is 64 LEDs arranged in an 8 row, 8 column matrix, just like a chess board. 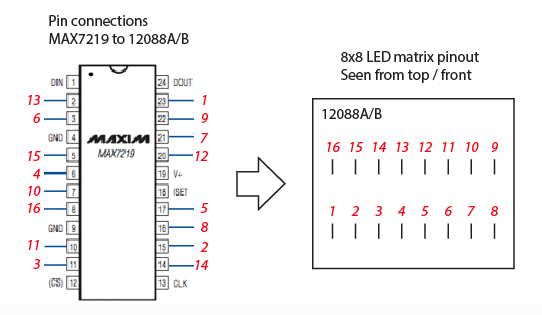 The Max7219 is used to control 64 LEDs at once. 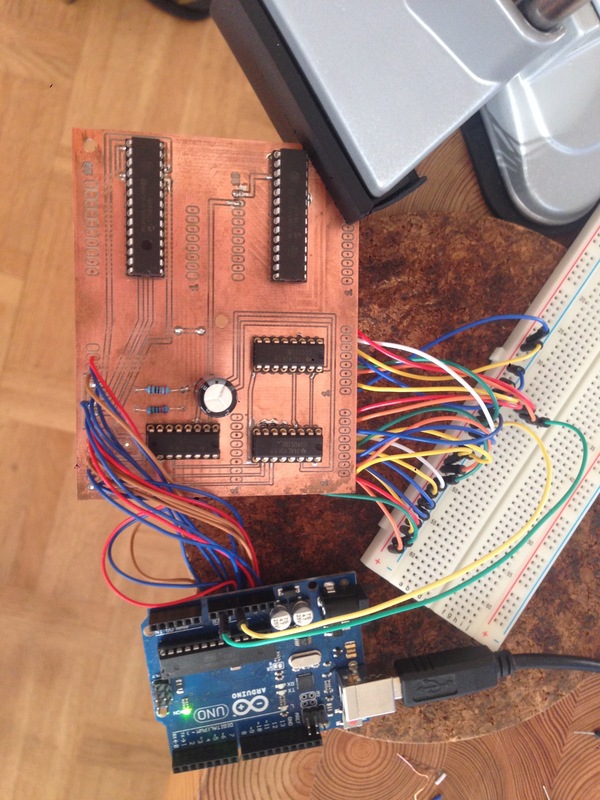 The Arduino sends data to the 7219 using the SPI serial communication protocol. You can have multiple SPI devices connected to an Arduino simultaneously. 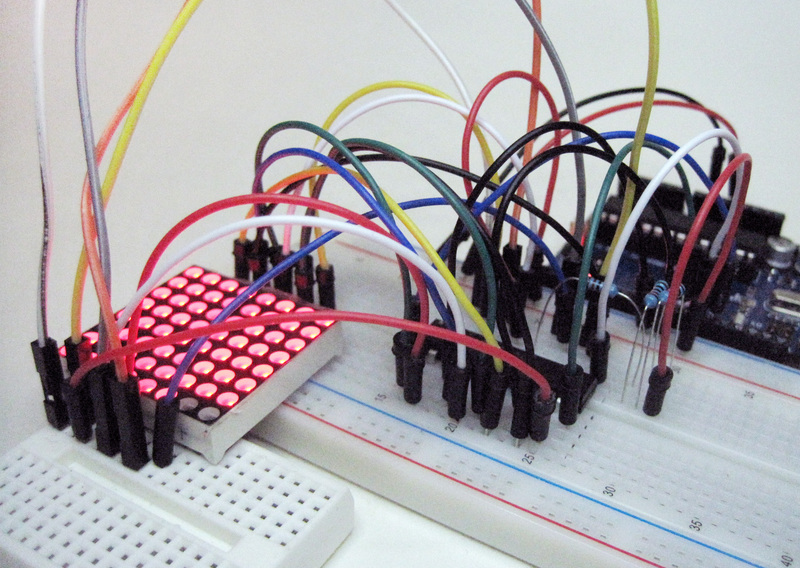 For your convenience, the Arduino uses a library to talk to the LED driver. The library takes care of the SPI communication and may also have methods for writing characters or scrolling images. 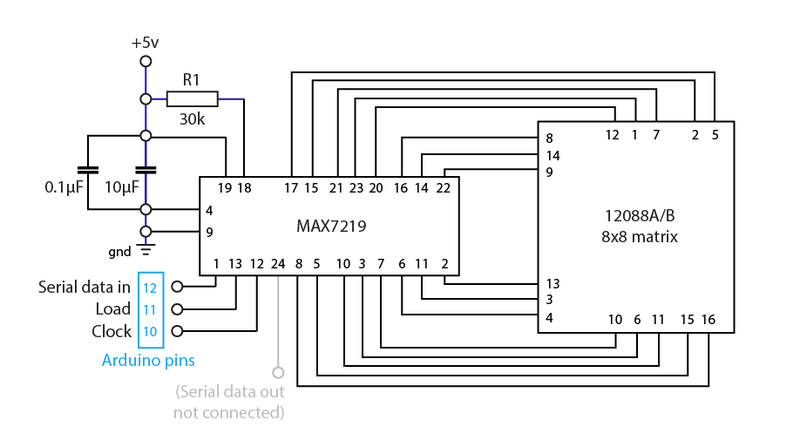 There are a number of Arduino libraries for MAX7219. I happened to chose LedControl. 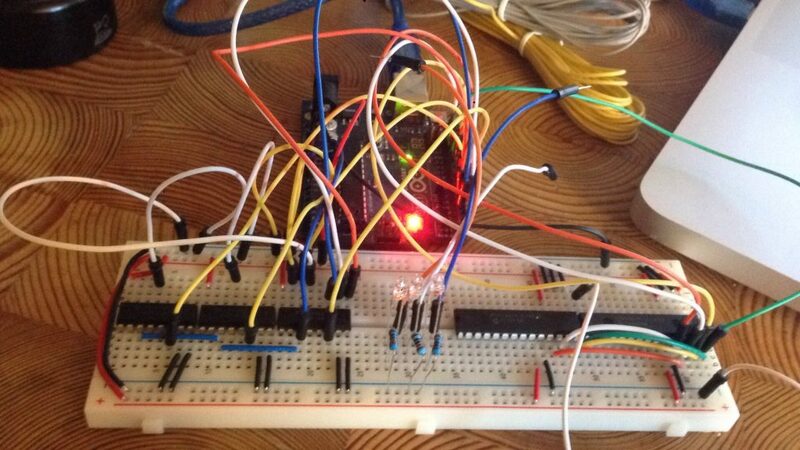 The hard part is to figure out the pin configuration of the 12088A/B LED matrix, and how to connect it to the 7219. 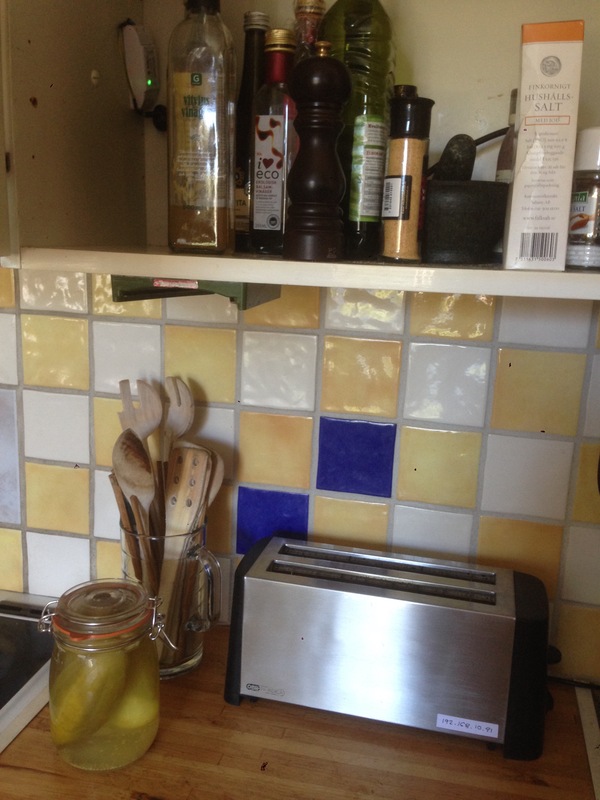 So here are some images to help you out. The light sensor is also called a light-dependent resistor (LDR) or photocell. It is connected to Arduino pin A0. analogRead measures the voltage at the pin. You will get a value between 0 and 1023 (where 0 equals ground and 1023 equals +5 volts). Changing the type of lamps and ambient light will give a bit of variation in your readings. In many cases a covered sensor equals about 500 and an exposed sensor is around 800. So under those circumstances an ON / OFF threshold-value of about 700 would be fine. The pot controls which LED is turned on. 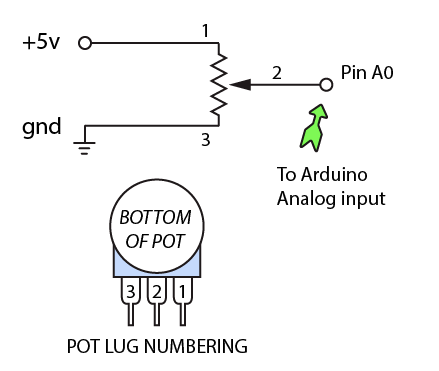 The pot is connected to Arduino pin A0. analogRead is used to measure the voltage at A0. You will get a value between 0 and 1023 (where 0 equals ground and 1023 equals +5 volts). The analog range is divided into 5 sections (1023 / 5). 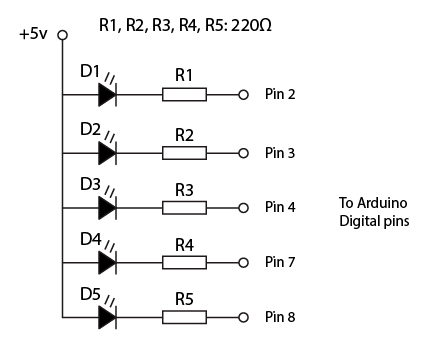 Five LEDs are connected to the digital pins 2, 3, 4, 7 and 8. Use a switch statement to address individual pins depending on pot rotation. Use a small delay to let the circuitry rest before doing the subsequent read, or the value can be erroneous. 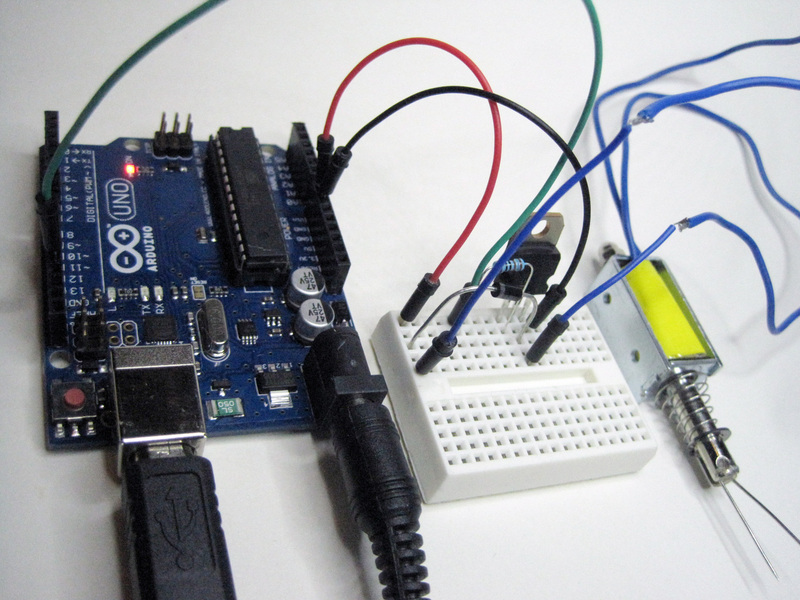 The USB connection is used for serial communication between Arduino and computer. The potentiometer pin 2 is connected to Arduino pin A0. analogRead is then used to measure the voltage at the pin. (The potentiometer rating doesn’t matter, but avoid lower resistances than 5k, so you don’t get an uneconomically high current flow.) You will get a value between 0 and 1023 (where 0 equals ground and 1023 equals +5 volts). Use a 12 volt solenoid or motor. 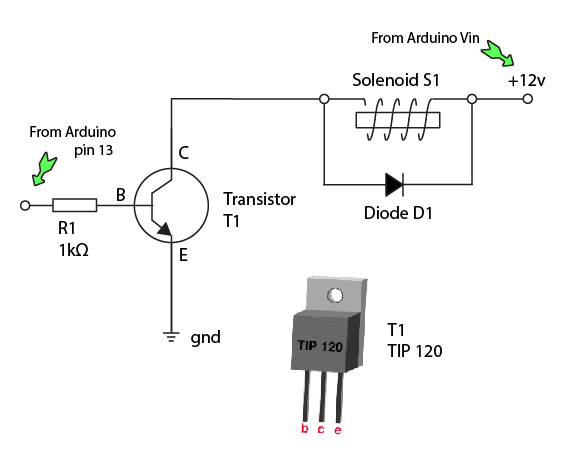 Connect a 12 volt power adapter to the Arduino board. On the board there is a pin called Vin that will provide the 12 volts directly from the power adapter. Use Vin to power the solenoid / motor. There will be a lot of current flowing through the solenoid. If the flow keeps on too long, the solenoid will get very hot. The on-time will probably needs to be shorter than a second. The term duty cycle means the relation between on-time and off-time. Generally the duty cycle has to be less than 50% if the solenoid shall be turned on and off repeatedly. Limit the current flow through the LED with a small resistor R1, ca 200~1000Ω. Otherwise the LED will burn. The LED can be connected in a few ways. 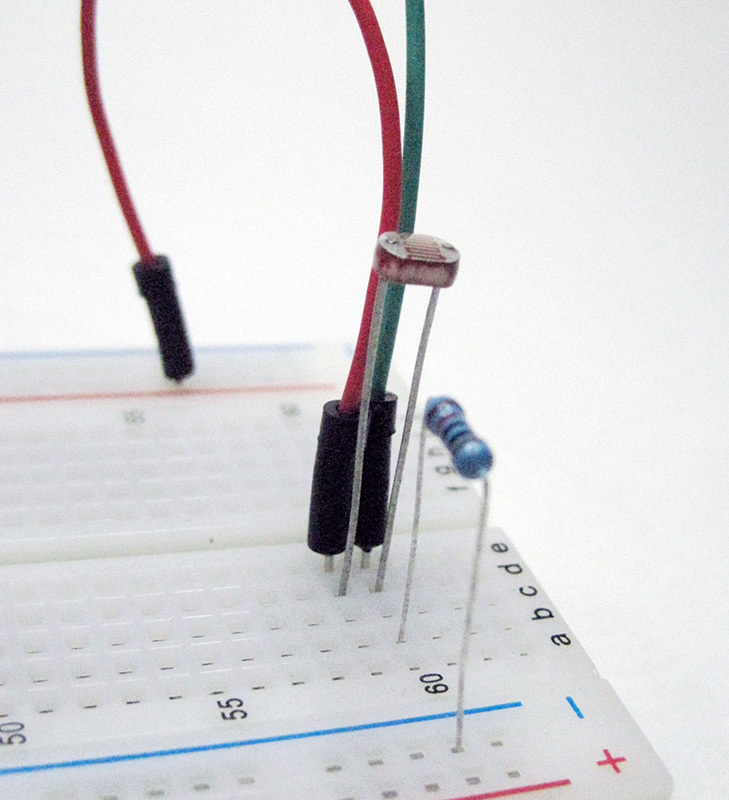 • Either the Arduino pin (pin 13 in this case) SOURCES 5v to the LED: the LED’s + pin is connected to the Arduino pin. The LED’s – pin is connected to GND. • Or the Arduino pin SINKS the circuit through the LED. The LED’s + pin is connected to +5 volt supply. 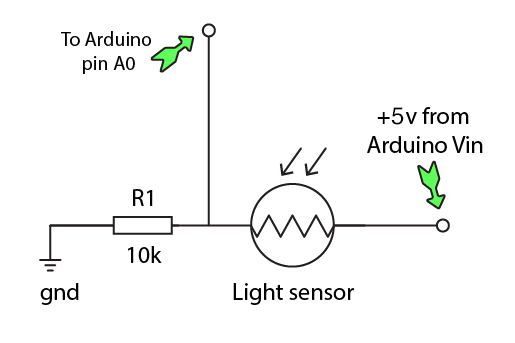 The LED’s – pin is connected to Arduino pin 13.